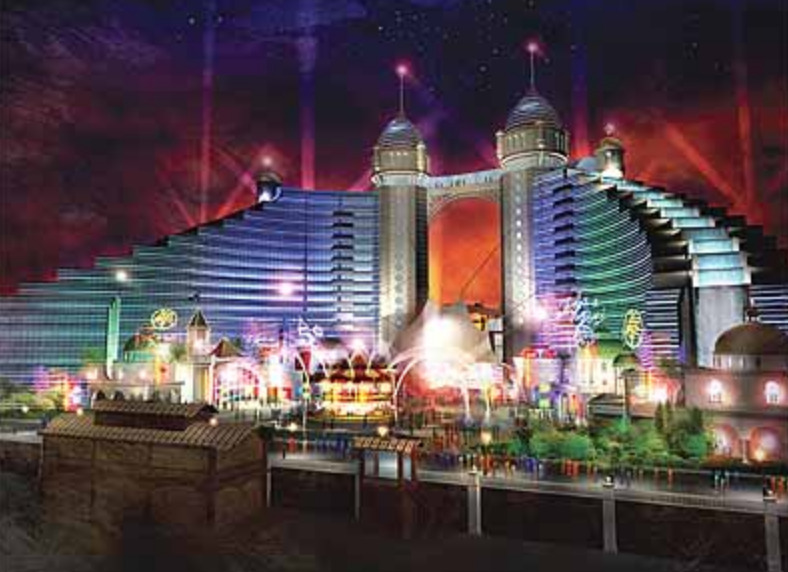 Flashback to an early rendering of the Vegas style shopping, entertainment, and hotel complex Joe Sitt first proposed for Coney Island. New York Magazine, 2005. 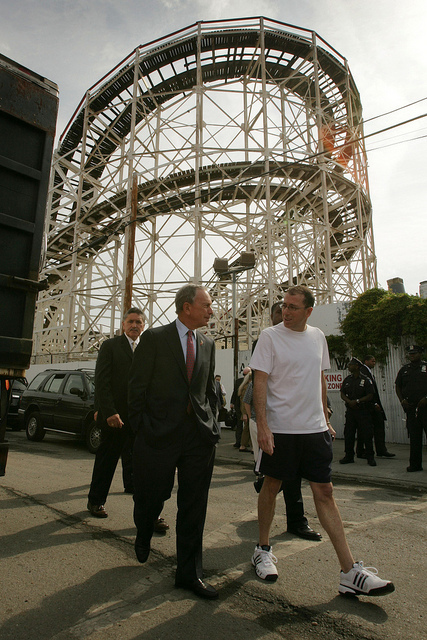 As part of the controversial Coney Island Rezoning of 2009, Thor Equities CEO Joe Sitt got Mayor Bloomberg to rezone his Surf Avenue property in the amusement area for hotels of up to 30 stories. A century old music hall fell to the wrecking ball and a generic looking retail building went up in its place but Thor’s hotels have yet to materialize. Now Sitt says he “needs some zoning changes” to build “a great big hotel” and a “stadium-style movie theater” on Stillwell and Bowery, according to a recent interview with NY1’s Jeanine Ramirez. We were shocked to read this news since the lots between Stillwell and West 12th bordered by the Bowery and Wonder Wheel Way were rezoned by the City for amusements, open and enclosed, and entertainment retail, not high-rise hotels. Why were we not surprised? 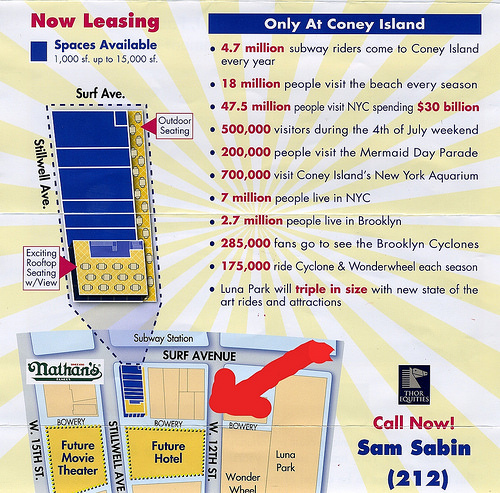 In 2012, Thor Equities sent out a flyer for leasing opportunities touting “Future Hotel” across from the Wonder Wheel and adjacent to Scream Zone and “Future Movie Theater” behind Nathan’s Famous. So this was Sitt’s plan after the rezoning and remains the plan, though the graphics vanished from Thor’s website a few years ago? Thor Equities’ long vacant lots are back to being labelled “Stillwell East” and “Stillwell West” on their website. West is home to the second season of Coney Art Walls. East is expected to host Go Karts and Mini Golf, which ATZ first reported as a rumor in April. 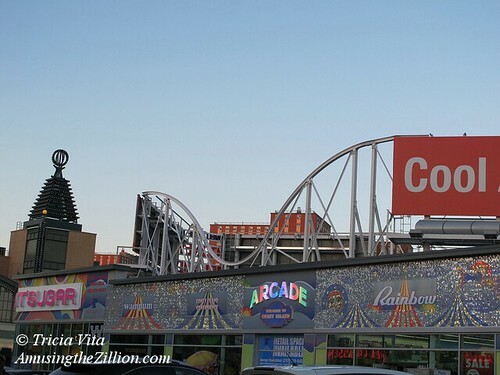 It’s great news if it’s true and proof that everything old is new again in Coney Island. Go Karts and Mini Golf were among the amusements evicted by Thor’s CEO in 2006, when he bought this property where rides had existed for more than 100 years. ATZ’s advice is to enjoy these attractions while you can because Sitt regards them as temporary activation of the property. In 2009, Joe Sitt got his zoning for high-rise hotels on Surf despite opposition from activists and advocacy groups and the New York Times. “We like the Municipal Art Society’s idea of doubling the size of the amusement area and removing hotels from the south side of Surf Avenue. This way, when visitors get off the subway, they will meet sunlight and open air, not a high-rise barricade,” said a Times editorial published on the eve of the 2009 rezoning vote at the City Council. The other fear voiced at protests and public hearings was that the “hotels” would eventually be converted to condos, which were part of Sitt’s original plans. The truly alarming part in the NY1 piece is Sitt saying he’s “dealing with” the City on the issue of the zoning changes. Who is he lobbying– the Mayor’s Office, City Planning? Is he setting the stage for applying for an economic “hardship variance” from the Board of Standards and Appeals? Be vigilant, people of the People’s Playground. It wouldn’t be the first time the zoning passed by one administration has been undone by another. Steeplechase died in 1966, after Fred Trump bought the property and threw a party to celebrate the destruction of the Pavilion of Fun, which is the subject of a new exhibit opening this weekend at the Coney Island History Project. “The Trump Organization office views the acreage as a potential site for a modern Miami Beach type high rise apartment,” according to the New York Times clipping of “6 Bikinied Beauties Attend Demolishing of Coney Landmark.” Trump’s effort to get the zoning changed to residential failed to get approval. 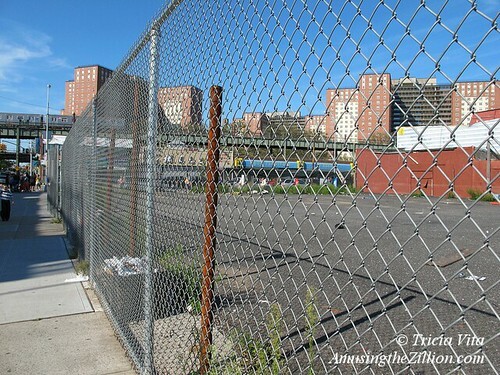 Thanks to the Rezoning of 2009, the City itself is planning to do what the City wouldn’t let Fred Trump do 50 years ago: Build residential towers on part of the Steeplechase site, where the MCU parking lot is now. Thor Equities’ CEO Joe Sitt is expanding his Coney Island empire by buying up three Bowery lots on both sides of West 12th Street. ATZ has learned that longtime property owner Jeff Persily and partner Matthew Weinberg are in contract with Thor to sell their property at 1105 Bowery (309 W 12th St), 1205 Bowery and 1207 Bowery. According to the agreement, the scheduled closing date is December 18, 2015. The acquisition has set off speculation that the Bowery buildings are destined for a date with the wrecking ball, as one of Thor’s long vacant lots on West 12th Street is zoned for a 30-story hotel. With the purchase of 1105 Bowery, which stretches from West 12th Street to Jones Walk, Thor will own the entire block bounded by Surf Avenue and the Bowery with the exception of one privately owned lot on Jones Walk. 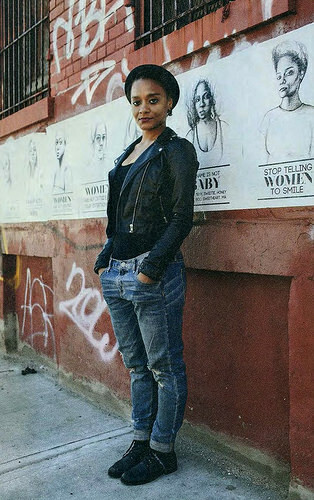 Apart from the current tenants of 1105 Bowery, the rest of the Thor-owned lots and buildings on the block are vacant due to rent increases, evictions and demolitions that began in 2007 and culminated in 2010. A few days before Halloween, Weinberg met with some of their Bowery tenants, which include a bar and grill, food stands, games and photo and souvenir booths. He informed them the property was sold and that a Thor rep would contact them, setting off rumblings in the Coney Island Rumor Mill. Who will get to stay, for how long, and at what price? Some tenants were told to expect “a moderate rent increase,” sources tell ATZ. The block where 1105 Bowery is located includes the vacant lot on West 12th across from Coney Island USA where the demolished Bank of Coney Island stood from 1923 until 2010, and the lot where the boarded up Grashorn Building, Coney Island’s oldest building, remains. The bank lot was rezoned for a hotel up to 30 stories, effectively dooming the historic building. Despite public outcry and a NY Times editorial against a wall of hotels on the south side of Surf, which will cast long shadows on the amusement zone, the Bloomberg administration pushed it through. The big beneficiary was Thor Equities’ Joe Sitt, who owns two of the Surf Avenue lots zoned for hotels. Tenants at 1205-1207 Bowery include Gyro Corner and neighboring games and souvenir stands on West 12th Street. At 1105 Bowery, tenants are Margarita Island Bar & Grill, the 5D cinema, frozen yogurt, a basketball and dart games, water races, a food stand on the corner of Jones Walk and a photo booth and tattoo shop. Gyro Corner was on the Boardwalk, where Nathan’s is now, until Thor sold the property to the City’s Economic Development Corporation, which turned it over to Zamperla. Gyro was among five Boardwalk businesses that got the boot. 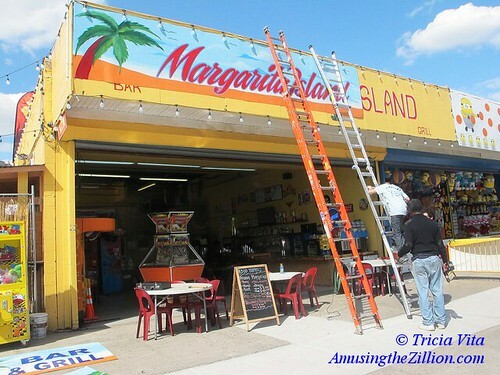 So did Beer Island, which was reborn last year as Margarita Island on the Bowery. Margarita Island owner Carl Muraca is optimistic about being back in 2016. He said Thor’s rep told him that “Joe Sitt knows you love Coney Island as much he loves Coney Island and he’s glad to have you there. We had a very positive conversation,” Muraca told ATZ. He is also a former Thor tenant, having owned Faber’s Fascination in the Henderson Building, a year-round arcade which lost its lease when the building was demolished. Muraca later moved his arcade to another Thor building, now vacant, on Surf. Thor Equities also owns the lots on the south side of the Bowery, from West 12th Street to West 15th Street. On the north side, Thor properties include the building housing the Eldorado Bumper Cars and Arcade and Thor’s new “Retail Ride of A Lifetime” building where the Brooklyn Nets Shop and Wahlburger’s represent the new Coney Island’s displacement of amusements for shiny new retail and franchises. We are keeping our fingers crossed that the Bowery’s Mom & Pops will be able to afford to stay in their spots next season and get more than a one-year reprieve. All are survivors who’ve had to move multiple times due to changes in property ownership leading up to and since the City’s Coney Island Rezoning of 2009. With redevelopment on the horizon for these blocks, the Bowery could be the last stand for some of these small businesses. 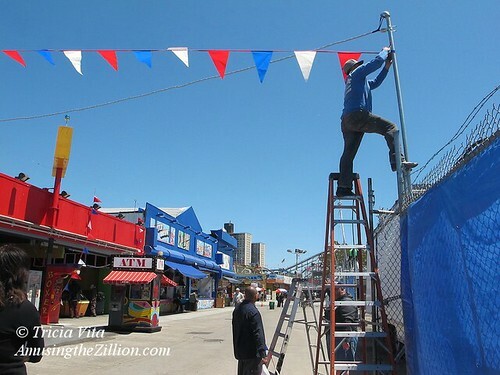 As we reported in “The New Coney Island: A Tale of Two Jones Walks” (ATZ, November 2, 2013), an amusement business owner who had leased a small stand on the Walk from Thor in 2008 told us in 2009 that the rent had tripled from $8,000 to $24,000. He declined the space and left Coney Island, never to return. Yes, it’s a part of Coney Island Walls. As one of the many artists who will be creating work, I want to be sure that Coney Island residents are represented in the show. I’d like to sit with a few people from Coney Island to discuss their lives in the neighborhood. From there I will shoot their photograph and draw their portraits from those photographs. The drawings will then be printed at large scale and installed at the Coney Island Walls. I’d like to meet with people between now and May 19th. I only need about 5-6 people. I’ll be installing the piece during the first week on June. This process is the same I use for my project, Stop Telling Women to Smile. 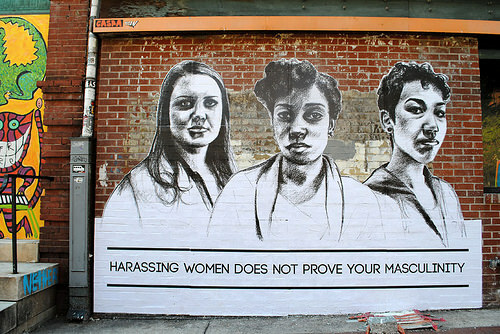 STWTS focuses on gender based street harassment. The Coney Island piece will look like this (see picture below), with the text potentially being a quote about Coney Island from one of the participants. If your zip code is 11224 and you would like your portrait to represent Coney Island in a show that is expected to be seen by millions of people this summer, contact the artist at tlynnfaz[AT]gmail[DOT]com. Today brought a new twist to the November rumor that an amusement park is coming to one of Thor Equities’ CEO Joe Sitt’s vacant lots in 2015. The latest from the Coney Island Rumor Mill is that there will be no rides (insert unhappy face emoticon) but about 20 trailers with games, food and merchandise. If true, the games would fulfill the “Use Group A” amusement component required by the zoning. As a critic of flea markets on land where the Tornado roller coaster (1927-1977) and the Bobsled (1941-1974) once thrilled, we were happy to see the BK Festival and Thor Equities bring in rides, games and sideshows in 2012. Why not do it again? Across the Bowery, Thor’s retail building is said to be the site of New York City’s first Wahlburgers –Donnie, Mark and Paul Wahlberg’s burger franchise– opening in May. There’s a vacant space on Stillwell next to the Brooklyn Nets store that was designed to house a restaurant. 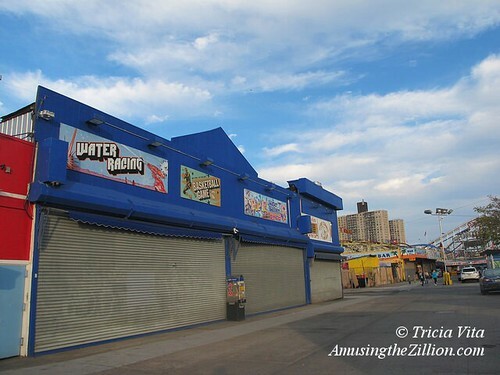 Rumor has it that is the location and it’s set to be revealed during the Wahlberg’s reality show on A & E.
March 24, 2014: Will Rides Return to Thor Equities Vacant Lots in Coney Island? With just 75 days left in Mayor Bloomberg’s administration, we’ve been taking stock of the new Coney Island, which began to take shape after the July 2009 rezoning and during the Mayor’s third term. Most of the City-owned land in the amusement area has been re-activated with amusements, starting with Luna Park (2010) and Scream Zone (2011) built by Central Amusement International on the vacant lots bought from Thor Equities for $95.6 million, and continuing with the installation of the B&B Carousell and relighting of the Parachute Jump in the new Steeplechase Plaza this year. The same can’t be said for adjacent property held onto by Thor CEO Joe Sitt. It became vacant after Thor acquired the land and evicted ride and park operators and remains vacant despite a history of various amusement operators efforts to negotiate lease deals. The latest project that never happened was Big Mark’s Action Park, which planned to bring a rock climbing wall, a vertical wind tunnel and other extreme attractions to Thor’s Stillwell lots in 2013. It’s a similar story as ATZ’s previous post “The New Coney Island: A Tale of Two Jones Walks” contrasting the activated City-owned and vacant Thor-owned sides of the Walk. This week last year, ATZ was saying goodbye to McCullough’s Kiddie Park, which had been on Coney Island’s Bowery for more than 50 years. 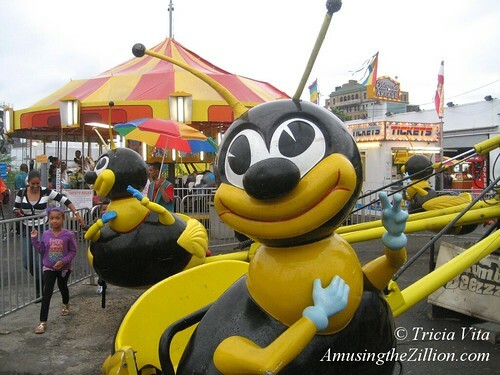 The McCullough family, descendants of Steeplechase Park founder George C Tilyou, were dismantling the Bumblebees and other rides and leaving Coney forever after failing to come to a lease agreement with property owner Thor Equities. Since then, the lot has remained vacant, just another one of Joe Sitt’s collection of interminably vacant lots in Coney Island. What Michael Daly wrote in the Daily News in 2009 after the City bought Sitt’s Boardwalk property is still true today: “Sitt is the city’s most successful un-developer. He spoke grandly of building a billion-dollar Las Vegas-style resort. What he has built is a string of vacant lots, the most depressing being where Astroland amusement park stood until a year ago.” Just substitute McCullough’s for Astroland. The sole building that Joe Sitt has built in Coney after years of real estate speculation is a temporary building at Surf and Stillwell with retail stores like It’Sugar and a Brooklyn Nets Shop but devoid of amusements. You’ve heard the phrase “dummy corporation” but did you know Thor Equities has introduced a new concept to Coney Island of dummy arcades? All season long, dummy arcade signs fronting empty space with “Retail Space Available” signs have made a mockery of the City’s 2009 rezoning requiring a percentage of amusements on the property. The rest of Thor’s Coney properties and lots remain vacant today. 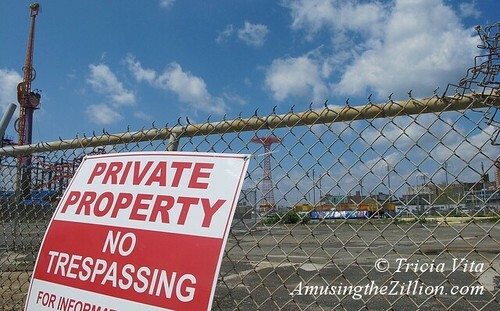 Unlike 2007, when Sitt first evicted Batting Cage and Go Kart City as well as the Zipper ride, which is the subject of a riveting documentary, Coney Island’s vacant lots are no longer in the news. 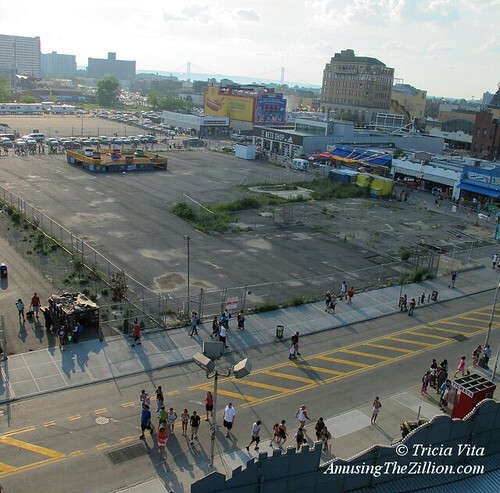 In 2008 and 2009, when the City was pushing the rezoning, Coney’s infamous vacant lots were mentioned by City officials as a reason for the rezoning. “THE END OF CONEY ISLAND IN 2009?,” said a “fact sheet” called “Coney Island Throughout The Ages” from the Coney Island Development Corporation. 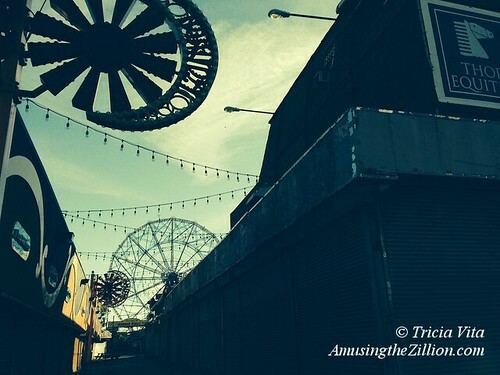 “Today, Coney Island is a ghost of its former self. Under the current zoning, amusement operators have divested, leaving illegal uses and vacant lots throughout the area.” Four years after the rezoning, the lots are still vacant with no end in sight. 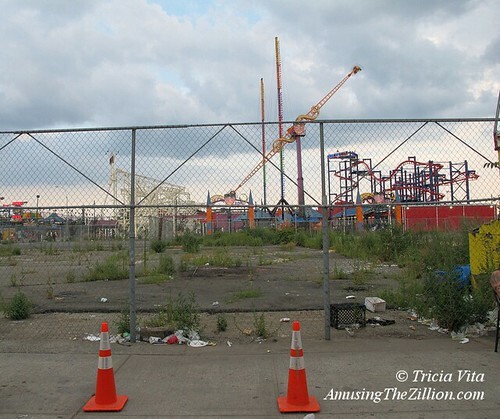 Photographs of newly created vacant lots like the ones in this post are rarely seen and illustrate the dark side of Bloomberg’s New Coney Island. Most people are happily snapping pictures of the new roller coasters and the crowds on the Boardwalk, which is as it should be. In fact, we’ve held off till the tail end of the season to post these depressing photos to avoid creating any bad publicity for Coney. On the other hand, our photos of vacant lots are free advertising for Thor Equities, whose new website “Thor Equities Presents Coney Island” revives their “Retail Ride of a Lifetime” slogan: “Thor Equities presents a new retail opportunity at a scale New York hasn’t seen in years! ThorConeyIsland.com is a retailers ticket to joining the retail ride of a lifetime taking place in Coney Island.” The site touts such stats as “18 million people visit the beach every season” and “4.7 million subway riders visit Coney Island every year” to lure retailers. The leasing plan pitches Thor’s buildings including the Grashorn, Coney Island’s oldest building, which has been vacant since 2008, but not the long-vacant lots. While the subject of Coney Island’s vacant lots has dropped from the headlines, the question looms: What is the future of Thor Equities vacant lots and buildings in the next administration? Some of the property was rezoned to accommodate 30-story hotels and retail in the heart of the amusement area but still requires an amusement component. Putting up glittery arcade signs where there are no arcades is a slap in the face of the zoning requirement. Will the City enforce its own zoning? Will Sitt try to get a variance? Will he continue to “sit” on the land and wait for infrastructure improvements? Will he flip the property? Will this land ever see amusements again? On Stillwell Avenue, where the Tornado Roller coaster (1927-1977), the Bobsled (1941-1974), and Stauch’s Baths and Dance Hall (1930-1998) once stood, Norman Kaufman’s Batting Range and Go Kart City amused the zillions until Joe Sitt emptied out the amusements in 2007. Last year, NY1 reported Sitt’s plans to put a movie theater with stadium seating on his Stillwell lot behind Nathan’s was being held up by the fact that the theater required an amusement element to it. Rumor had it the city wanted him to put a ride on the roof. How cool would that be? 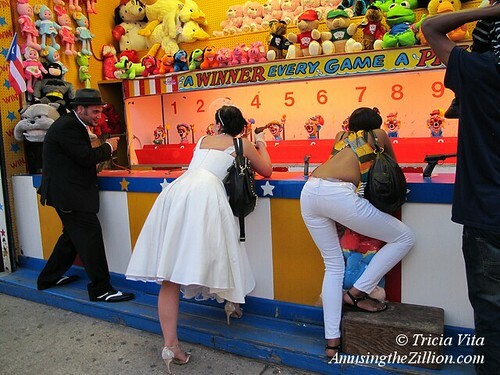 As long as Sitt can’t be bothered to install the minimum amusements required by the new zoning in his first building in Coney Island — a couple of tiny arcades– don’t hold your breath. 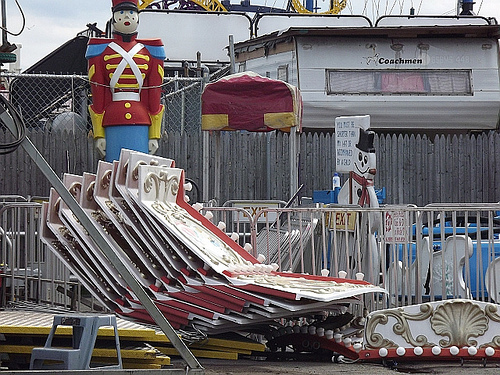 Not done desecrating Coney Island’s amusement area by evicting longtime tenants and creating empty lots, Thor Equities moved on to London in 2010. 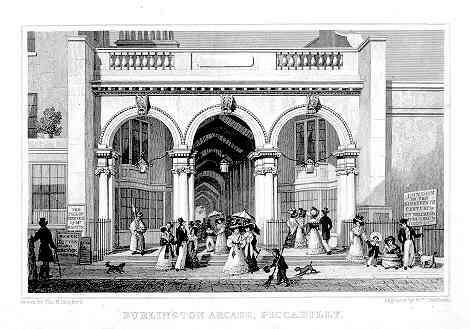 Joe Sitt’s first European acquisition was the Burlington Arcade, London’s first covered shopping arcade, built in 1819, which was purchased with Meyer Bergman. ‘Save Burlington Arcade’ – AGAIN! I am writing to ask for your help once more. The campaign to Save Burlington Arcade has been spurred back into action just a few months after our victory last year. The Arcade owners have now submitted fresh plans to Westminster City Planning Department to replace the existing floor with a brand new highly-polished black and beige quartzite tiled floor. Hard shiny quartzite can already be seen in modern shopping malls (and bathrooms) the world over. I believe it would be completely out of character and wholly inappropriate in the Arcade, which is not a Las Vegas or Dubai-style shopping mall. When the original applications were submitted last year to ‘modernise’ the Arcade, celebrity protestors included Dame Judy Dench, Stephen Fry and Joanna Lumley along with other notable supporters such as Deputy London Mayor Kit Malthouse, Ken Livingstone, the Baroness Boothroyd, Rob Brydon, Alan Davies, Kelly Hoppen, Jay Rayner and Michael Winner. They all lined up alongside hundreds of ‘ordinary’ horrified Londoners and visitors alike, to make their feelings known. The Arcade’s foreign owners (Joseph Sitt of Thor Equities & Mayer Bergman) dreamed up sweeping changes, with infamous American ‘architect’ Peter Marino, to oust small traders in favour of big-name fashion brands such as Prada, Gucci and Chanel with their infinitely deeper pockets. Burlington Arcade is part of our heritage and must be preserved. If commercial owners do not appreciate what they are buying into when they invest into such unique properties, that is their problem – we should not let them vandalise our city just to make a quick buck. The clock is ticking – and we only have until March 31st to lodge objections to their submitted planning application. Anyone who wishes to object must do so quickly – details of how to object can be found at my website: www.bexfield.co.uk. Or you can write to: Westminster City Planning Department, Westminster City Hall, 64 Victoria Street, London, SW1E 6QP, quoting the reference no. 12/01433/LBC, along with your name and address, stating that you ‘object to the application’. London’s Westminster Council is to be commended for meeting the challenge of preserving an historic property. To the Council, we would say Joe Sitt has a long way to go to prove the Coney Island doubters wrong. What he has done here is evict amusement operators, demolish historic buildings and create empty lots. After seven years of predatory real estate speculation and many grandiose renderings, Thor Equities first-ever new construction in Coney Island (flea market tents don’t count) was revealed to be a sterile-looking building suited for a suburban mall. Thor’s space for lease signs with the odious slogan “Coney Island: Retail Ride of a Lifetime” are an insult to Coney’s unique and glorious history. The vacant new building stands on the site of a century-old music hall that was sacrificed by the City of New York in the Coney Island rezoning and demolished by Thor Equities. Coney Island had 64 rides when we did our annual ride census in April, but starting this week it will have 62. McCullough’s Kiddie Park, whose colorful banners trumpeting “More Rides” had a dozen rides, is losing two. The kiddie park owner is getting squeezed out by Thor Equities. 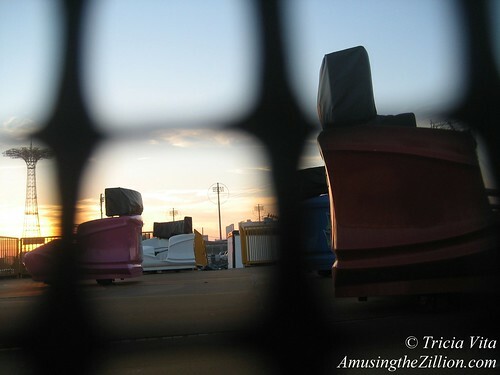 A section of their park occupied by three rides–the Frog Hopper, kiddie train and boats– is a lot owned by Thor and was subleased to them a few years ago by Norman Kaufman. Now that the sublease has expired, Thor Equities reportedly offered a new lease with such onerous terms that the park’s owners will not sign it. The three rides have to be off Thor’s property by Thursday, June 16th. On Monday, the little park’s train ride was sent packing. The kiddie boat ride also went bye bye. Meanwhile, the majority of the other rides had to be dismantled and rearranged to accommodate the Frog Hopper, which is staying. 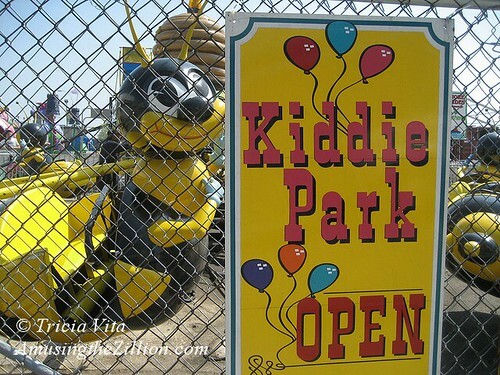 McCullough’s Kiddie Park, located at West 12th and the Bowery in Coney Island, will reopen this weekend with 10 rides. The McCullough family is related to Steeplechase Park’s Tilyous and has owned and operated rides in Coney Island for many years and we hope many years to come. In 2005, Jimmy McCullough sold the B & B Carousell, the last wooden carousel in Coney Island, to the City after the death of his business partner Mike Salzstein. You can listen to Jimmy McCullough’s interview about learning the carousel business from his father, James McCullough, who began his career working on the Steeplechase and Stubbman carousels, in the Coney Island History Project’s Oral History Archive. 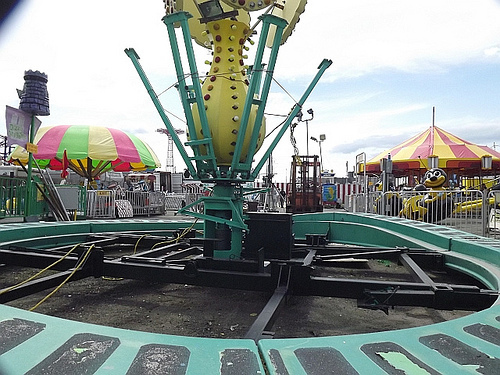 Joe Sitt, CEO of Thor, on the other hand, has zero rides on his Coney Island property. 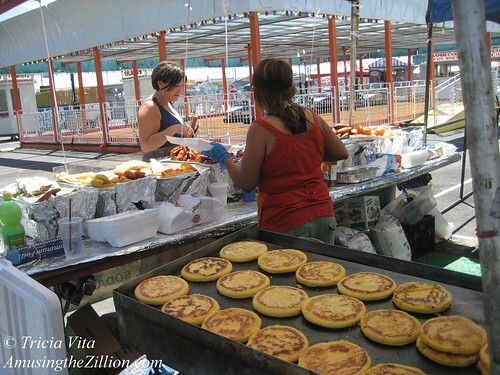 What he does have is a dismal flea market disguised as a festival because flea markets are not allowed by the zoning. Despite what you may have read in a NY Times puff piece on Sitt, the flea does not feature “upscale product.” What’ll he do with the tiny lot reclaimed from the kiddie park, put in a few more flea market tables? 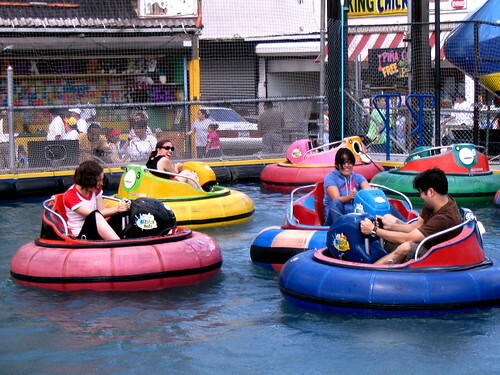 April 22, 2011: Coney Island Has 64 Rides and 30 Weekends of Summer!